Q: I am hoping you can help me with my Annabelle Hydrangeas. Last year I planted 15 small plants. This year they look as though they are receiving IV steroids every day. They are 5 feet tall and have enormous flowers that are absolutely beautiful. The problem is that we have had so much rain and when it rains they fall over from their weight and size. What can I use to support them and what is the best way to prune them so they do not grow this large next year? Last fall I cut them back so that there was about 1 foot of the plant showing. I live in Chicago and they are covered by snow all winter. If you’ve been having the same rainy weather we’ve had in Toronto (the rainiest June on record; and it ain’t ovah yet), that’s the reason the Annabelles have done so “well” — in quotation marks because the rain makes the plants taller and the flowers bigger, but then they are even more heavy headed when filled with rain. The “hydra” in hydrangea relates to their love of water. Sounds like you did all the right things. One thing I do to give them a bit more support (though mine are flopping now, too) is to leave last year’s stems a little longer. In other words, prune them back to 18-24″ rather than 12″, giving them a woodier base. Cut them back in spring (not fall) to just above a set of fat buds. Cut out any weak-looking stems to the ground. 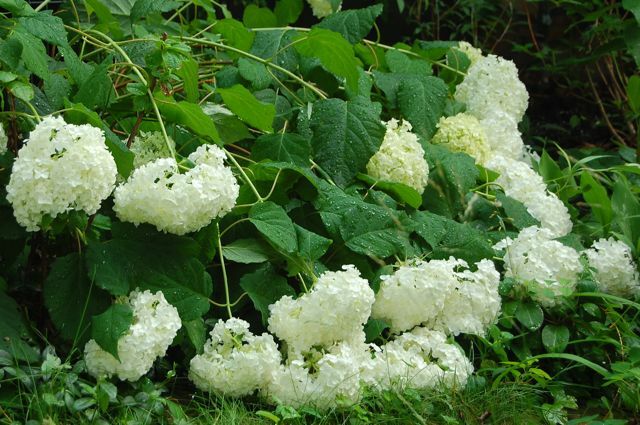 Our post about pruning Annabelle hydrangeas is one of our most popular hits. You could also try staking them next year. Inset thin bamboo stakes (mimicking the framework of the shrub) which you connect through the body of the shrub with a network of twine. Do it at about the time the shrub begins to set flower buds, when it will be close to mature height for the season, but before the flowers become too heavy. Cut off the tops of any stakes that protrude above for a more natural look. With 15 plants, staking would become a big job for you, though, and you probably chose Annabelle for its easy care. I don’t stake mine (as you can see by my Annabelle Goes To Oz pictures). There is an improved version of Annabelle out now from Proven Winners. It’s called Invincibelle Incrediball (and a similar pink version called Invincibelle Spirit), and I believe the main improvement is that it is less likely to flop. I don’t know how well those claims would stand up, literally or figuratively, in this year of the big rains, though. 2010 has been an unusual summer. The Annabelles aren’t always this big, and they aren’t always flattened, so frequently, by so much rain. You could give them another try without intervention next year and see what happens. Some things are beyond our control, and simply require a Zen attitude. Hope that helps. Let me know what you decide to do. P.S. Anyone else out there have good solutions? Please comment. How about a thick stake and some twine:) My Paniculata Pee Gee Hydrangea winterkilled horribly this year so I cut it back down to the base It is growing back quite nicely and is now 8 inches tall. Do you think It will flower this year? My garden is in zone 3. I have a baby Invincibelle Spirit. It's blooms are standing upright. How it will be as a mature plant is unknown, but so far, so good. As for the floppy 'Annabelle,' I bet those tall, sturdy individual stems stakes would help a lot. I use them for my super-floppy herbaceous peony. This year I didn't cut back any of the old wood, and placed peony rings around each plant. However, the Annabelles are in the 5 foot + range, so the rings just aren't tall enough to do any good. For next year I'm thinking some type of tomato cage. In the few weeks between the retirement of our Blogger blog and the refinement of our new one (unfortunately, we lost a few comments during that brief time), a commenter mentioned that he uses tomato cages, cut open, to support his ‘Annabelle’ hydrangeas. This sounds like a good, inexpensive solution. Oh the rains been terrible this year! I've been having the same problem, but with my peas. They've needed a lot of additional support this year. Sigh. At least I got them strung up a little more last night, because it's raining again. A lot! I like to intertwine cut branches through the stems in the spring to help support my Annabelles. But this year is such an unusual year – early spring, lots of growth, now tons of rain – that it's hard to predict anything. I planted Annabelle with the expectation that she would flop and boy did she ever! That plant grew in a part of my garden where the floppiness got integrated into the flower composition. And yes, when it rained the mop heads got so heavy they touched the ground. Eventually I discarded the plant. In my opinion, the new introductions from Proven Winners, Invincibelle Spirit and Incrediball will need another season or two to be properly evaluated. Although they are now available here in Zone 5b Montreal, they are still sold in sizes too skimpy to produce results that can be fairly evaluated. Those that I have planted look disgraceful. Mine are flopping a bit too. I try to crowd them together to have them hold each other up. I also think that the more sun they have the less likely they are to flop. 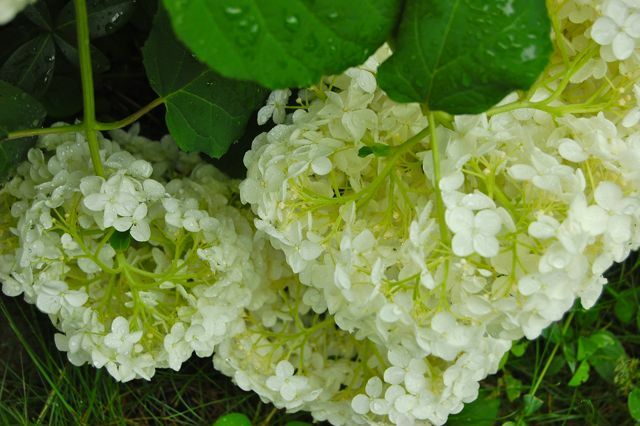 I have 'White Dome' and that one does not flop, though it is not as showy as 'Annabelle' it is quite floriferous. I'm glad to be reminded that 'hydra' refers to the hydrangeas love of water. I think I'd better water mine a little. They are in a dry spot – and many of the June rains have missed our hill. mine grow on the north side of a 4 ft. fence. They grow 5-plus feet every year, and this year was a major bumper for no. and size of blooms. No flop, probably because I don't prune, except when surrounding plants are overwhelmed. Stems get quite woody and are so dense they support each other. Main problem with this approach is that the centre died out a bit as bush grew. This year, it reached such mammoth proportions (4 ft by about 7 at base, bigger at top)that I dug a whole bunch up. I gave my sister four plants and a bunch of bare roots for her new house and made a hedge out front with four more. There's still a big bag of bare roots under the deck and another 2 X 2 section in the ground that I will dig up, divide in two and add to hedge this week. I fear that bare roots will end up in the green bin as my neighbours seem to prefer annuals. If you still have those roots, I'd be happy to pick them up and spread the beauty in Toronto. Hi, Mehdi, As that commenter commented two years ago, the roots might have found another home by now! But keep dropping by… you never know what you might find here.